We are especially excited to have Qualfon here because they represent a different generation and a different mindset in this industry with the way that they approach business. Qualfon, a people-driven business process outsourcing (BPO) company and global provider of contact center services, received a vote of thanks and loud congratulatory applause from the Mayor of the City of Harlingen, the CEO of the Harlingen Economic Development Corporation, City Council members, and also from members of the Harlingen Chamber of Commerce and the community at large during its grand opening ceremony held on May 28th. At the event, Qualfon cut the ribbon on its new contact center, which will create 1,000-1,200 new jobs in Harlingen, Texas. “This is not just another call center opening and not just another outsourcer coming in to ‘land and expand’ or set up a short-term operation and close shop in a couple of years or take jobs away from Americans. Just the opposite. 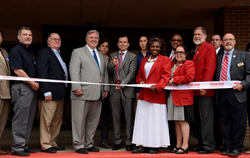 This opening represents an important step to provide meaningful work and employment in Harlingen and meet the high demand for the provision of outstanding customer service,” said Michael DeSalles, Principal Analyst at Frost & Sullivan, as he took the podium. The company mission enables Qualfon to effectively engage employees, which then lowers attrition and operational costs and generates higher quality services for clients and customers. With the mission programs in effect in Harlingen, Qualfon managers expect to achieve employee tenure rates that are two times higher than the industry average. “With unquestionably the lowest attrition rates I’ve seen in the industry, I can tell you that Qualfon nurtures, cares for, and develops its employees. They clearly recognize employees as the company’s greatest asset,” said DeSalles. “It’s exciting to be able to partner with a company like Qualfon here in our community. Qualfon has a great business model and a strong vision for how it wants to operate, and we have a wonderful workforce to make that vision become a reality,” added Mayor Boswell. Qualfon’s new contact center is located at 2200 Haine Drive. Operations are already underway at the 42,169 square-foot site, where 147 Qualfon employees currently provide customer support services in the identity theft protection industry. But the number of employees is expected to increase dramatically as Qualfon continues to invite new and existing clients to do business in Harlingen. Qualfon will offer a variety of job opportunities in the areas of customer care, technical support, sales, customer retention programs, as well as back-office services, and it is currently hiring customer service representatives, technical support representatives, and experienced managers. For more information on available positions, contact Patti Galvan at 970-266-7029 or PGalvan(at)Qualfon(dot)com.